Don’t call it hiking. That was the first thing I learned about hiking in the Scottish Highlands. It’s hill walking. Don’t forget it. “Hill walking! It makes more sense, love. It’s just walking in hills. Why do you Americans need another word for it?” a coffee barista in Edinburgh corrected me when I told her I planned to begin hiking the next day. I’m not sure why my friend Glynnis agreed to come along when I told her my plans to hike through the Scottish Highlands a week shy of my 36th birthday. Hill walking in one of the least sparsely populated regions of Europe seemed to offer just the right amount of adventure for two girls looking to escape the busyness of work and city life for a little while. I’d just finished writing a book and had given it over to my editor. Glynnis was just starting one. We desperately needed to be somewhere without our computers, even for a few days. “It will be like Little House on the Prairie meets Brigadoon,” I’d offered as a way of making it seem more appealing to my friend. We’d meet in the Scottish Highlands for a camping adventure. But, when the distance between home and getting out into the wilderness requires two planes, two trains and many car rides, you can’t exactly bring the best of your camping gear…or really any at all. That’s how we discovered bothy camping. Bothies, pronounced with a soft b and an “awww” sound in the middle, are a distinctly Scottish creation. Simple, privately owned shelters (often small cottages) in the most remote areas of the United Kingdom, bothies are open to all campers, free to use and governed by a strict etiquette. Of course there are camping huts in various rural areas of the United States and throughout the Alps, but those often require fees and advanced reservations. Bothies are like a well-maintained free-for-all, a camper’s utopia constrained by the conservative politeness of the United Kingdom. While they have four walls and a roof, bothies contain no running water, no lights and no beds. There may a sleeping platform, but often they only contain a stone floor for resting your weary hill-walking head. 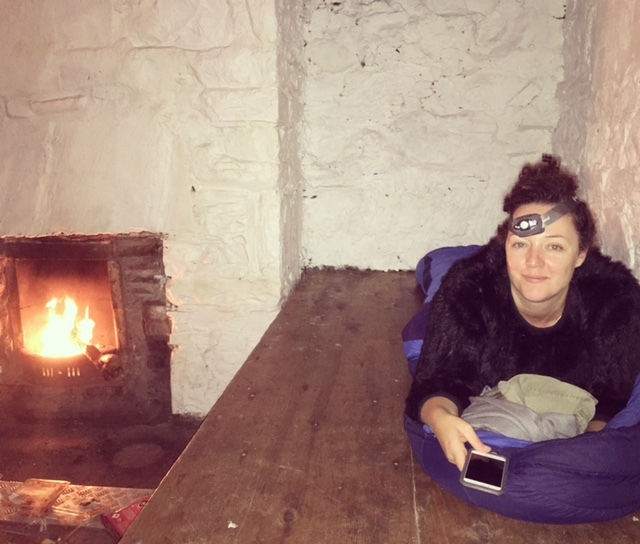 Committing to bothy camping has the feel of joining a secret society. “You should hire a guide,” my husband Nick, a skilled hiker and camper, warned prior to my trip. “The bothies are remote. You could get lost.” He wasn’t being overly cautious. I often get lost in our Bay Area neighborhood on the occasion that my phone dies and I lose access to Google Maps. I attempted to contact several guides, but was quickly informed that bothies don’t accept commercial tourism. Locating suitable bothies along hill walking trails, ones that could be accessed by a day’s walk was another matter. Neil mentioned that I should try cross-referencing the Mountain Bothy Association website, which provides a map of locations, but little information about how to reach them. with the Walk Highlands website that provides wildly detailed information about hill walking trails throughout Scotland. Drive to a village called Drymen. Take a road that leaves from the centre of the village signposted to Balmaha, which is another small village. Follow the road through Balmaha and carry on to a place called Rowardennan. Leave the car. Look out for a rough path descending on the left hand side to the lochside. The start should be marked by a small pile of stones. Sounded easy enough. But, the weather had other plans for us. “And we aren’t dressed properly?” I said. It was more of a statement than a question. We stayed in a hotel that night. The Mountain Bothy Association maintains just over 100 bothies in the United Kingdom, the vast majority of them in Scotland. Bothying, as a verb, dates to just after World War II when the Scottish economy grew more robust, allowing wage workers more leisure time. It coincided with a decline in farming, an exodus into cities and an abandonment of remote farmsteads. Intrepid hill walkers in the forties and fifties often slept in deserted farms and dilapidated estate cottages to avoid the harsh Highland wind and rain. In the 1960s, a group of like-minded hill walkers began repairing and maintaining these remote shelters. They slowly gained legal permission from estate owners for hill walkers to utilize them. That’s how the Mountain Bothy Association was born. By 1991, the association was given a British Empire Medal for service to outdoor recreation. Last year the MBA celebrated its 50th anniversary and received the Queen’s Award for Voluntary Service. The maintenance of free bothy shelters for all hill walkers works because the MBA has created a code of conduct for bothy users. While it can’t legally enforce any of these rules, their very existence keeps the average hill walker in line. The bothy code requires that you leave the bothy clean and tidy with dry kindling for the next visitor. You’re required, as Neil mentioned, to make all visitors welcome. MBA members in particular are encouraged to set a good example for other hill walkers. All food and supplies must be carried in and out. Trash that can’t be burned needs to be taken with you. A spade is provided to dig a temporary toilet far away from the bothy. Visitors are discouraged from traveling in groups larger than four. We considered driving farther north. There was the Schoolhouse bothy in between Inverness and Ullapool. The structure had been home to a one-class school until about the 1930s. One newspaper report claims that the pupils often had to use stilts to cross the “swollen river Einig,” just to make it to their lessons. There was also an old stone bothy with the gutturally unpronounceable name, Achnanclach, perched just outside a shallow sea loch curiously called Kyle of Tongue. We were soon warned off both those bothies due to it being stag stalking season in the Northern Scottish Highlands. Stag stalking is the Scottish way of describing deer hunting. “So we might get shot?” I asked. “That’s a possibility,” came the reply from a local forest guide. In avoidance of both bogs and stag stalkers we headed to the Cairngorms, Britain’s largest National Park, and most extensive range of high mountains in the United Kingdom. Even from the edge of the park we could glimpse the Cairngorms’ tundra-like wilderness plateaus and dense groves of ancient Caledonian pines reminiscent of J. R. R. Tolkien’s magical forests. Neil, perhaps growing tired with my incessant questions, informed us by email that a bothy by the name of Ryvoan would be relatively easy to reach on a three or four-mile hill walk away from a car park just outside the town of Aviemore. “Bring along some whiskey to share in case there are others in the bothy,” a guest in our hotel had warned us. “Sharing your whiskey is the easiest way to make new friends in the bothy. And singing the traditional bothie songs. But those only make sense if you’ve drank a lot of whiskey.” With whiskey in hand and a backpack filled with pub cheese, Cadbury chocolate, haggis and Scotch eggs, we felt ready to tackle the Cairngorms en route to Ryvoan. But the straightforward trail soon veered off into a half dozen tributaries, leaving us to guess at the direction of the shelter. We had no idea which direction would lead to a suitable shelter protected from the wind and rain. I glanced at Glynnis wearing a rabbit fur sweater and gnawing on our last Flake bar. “Are there any predators in Scotland?” she asked. I’d been looking this very thing up with the last bars of 3G powered Internet on my phone. I chose a path and hoped it was the one that would lead us to shelter. 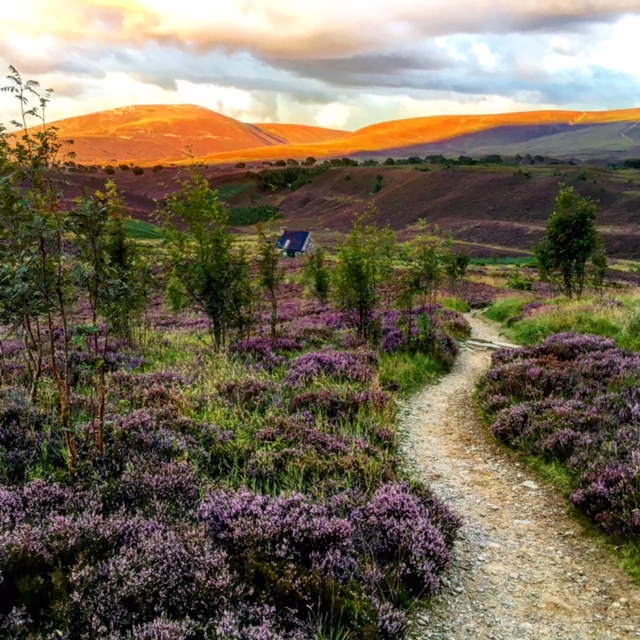 We continued our walk up and over rolling hills blanketed in royal purple heather, leaping over gurgling mountain brooks and skirting a loch so green it had to be a home for fairies. The still damp air smelt vaguely of peat and something smoky, like the aftertaste of Scotch whiskey. The later it got, the mistier the alpine forest became. “It’s is just like Brigadoon,” Glynnis said in half wonder, half fear, pulling her sweater tighter around her shoulders. It was. The classic 1954 movie, based on an old Scottish legend, tells the tale of two hill walker stag stalkers played by Gene Kelly and a sorely underrated Van Johnson, who get lost in the Scottish Highlands. Suddenly, a mysterious village appears out of the mist. The locals take in the wayward walkers who soon learn the town and its people are cursed. Every night when the townsfolk lay their heads on the pillows the village will disappear for the next hundred years. For the sleeping townspeople only a single day will have passed. I can’t tell you how the movie ends, but I promise that it’s well worth watching. And it does have a happy ending. Kind of. The sun had nearly fallen beneath the mountains when we began to ascend up yet another hill and around a bend, nearly tripping on tree roots that cracked up through the rocky path. And then, like a magical village emerging from the fog, we saw it—a small stone structure so tiny and quaint, it was likely inhabited by a hobbit. “That’s it!” I exclaimed in delight. “Are you sure?” Glynnis asked. “Nope. I’m not sure at all,” I said as I approached it with the wary American sense that someone could jump out and yell at me to get the hell away from his property at any moment. But true to the welcoming bothy ethos, the door was unlatched. The single room inside contained a wooden bench for sleeping, a table and a stone fireplace. Someone had hung pots and pans from the ceiling, a welcome surprise for two city girls who had brought their food in a plastic Tesco bag, perhaps expecting a magical microwave. Another kind traveler who came before us had left us three matches and six tea candles, a second blessing since we’d forgotten to bring anything with which to make a fire. A poem was framed on the bothy’s door that read as though it’d been written just for us. The dark water of the Green Loch, And the pass beyond Ryvoan. We made a fire with just one of the matches, saving the last two for those who would come after us. Would anyone else come that night? Would we sing bothy songs and share our own whiskey? A near full moon lit the trail outside, revealing a pair of fellow hill walkers, walking sticks in hand, headlamps shining. “Do you think we’re going to be murdered?” Glynnis asked me. “No. There’s a code against that,” I said. But our fellow travelers merely waved into our window and continued their way onto the next shelter. Glynnis passed the bottle of whiskey to me. “I would have welcomed them,” I said. Exhausted from our hill walking, safe and warm in the old stone cottage, I allowed my eyes to droop. “See you in the morning Glyn,” I said, as I turned off my own headlamp. 6 comments on "Ye will sink! Bothy camping in the Scottish Highlands"
Love it! I visited a bothy some years ago and it was similarly wonderful. Absolutely entertaining and quite humorous walk in the hills. I gotta do that! You certainly got the feel of my homeland. One comment – in Scotland, it’s whisky without the “e”. I really enjoyed the adventure hill walking in Scotland. It made me laugh.